You’d have to be naïve or stubborn to attempt to analyse the art during an opening. Chatty crowds and free beer tend to hamper any close reading of that work hidden behind a cluster of close-knit conversations—and if any meaning is found in that, it will likely fade come sobriety the next morning. However, the combination of these four Glasgow-based artists in the exhibition 1,2,3,4 begs for an exception to the rule. The diversity of works here, both individually and collectively, present deliberately incomplete thoughts, like one half of that couple anxiously awaiting the other to complete their sentences. Under this heavy openness, one becomes desperate for the gallery’s extraneous elements, up to and including the ‘Drunk Descending a Staircase’ towards Doherty’s tongue-in-cheek ‘Readymaids’, awkwardly clutching his four bottles of beer as though the joining of that number could somehow complete this exhibition’s equation. Fortunately, the sense of pop-reverence already spotted in Doherty’s saucy prints of French maids sourced from the Internet is dually reflected in the works presented by David Sherry and Owen Piper. The latter’s ‘Cola Column’ sets a bottle of the surprisingly dense liquid on a tall pedestal fashioned from a Brancusi-style configuration of black plastic bins. A ribbon of text spirals around the bottle in a tight circumference forcing the aspiring reader into literal dizziness; this intoxication, in close proximity to Sherry’s ‘Bottle Growth’, lends a strange logic to the peculiar image of the artist sporting a grotesque tumour of plastic bottles emerging from his head. Combined with Sherry’s video, ‘Coke Dance’, in which a spill of the sugary drink gradually drying adds a mad stickiness of sound to his frantic jig, one could perceive a united front, a bottled conversation describing in clear terms the true toxicity of this sweetness. Almost. Consider, for example, the way this frenetic activity is frozen by Doherty’s other contribution to this show, ‘Waiting to Fall’. A near-inevitable first encounter with this video shows the artist in an unremarkable space, standing blandly stationary with only his white crash helmet to indicate that something Just Isn’t Right. That, and his stumbling resistance to his own inevitable collapse from over thirty-five hours of sleeplessness, provides an arresting spectacle of nothing for which Doherty’s resoundingly violent fall provides an unsettlingly sadistic climax. Mick Peter’s dominant sculptural mass at the centre of all this presents yet another complication: how does one reconcile a reference to Bertrand Russell’s Flying Teapot, that most cynical refutation of the existence of God, in the midst of all this cola-flavoured kitsch? 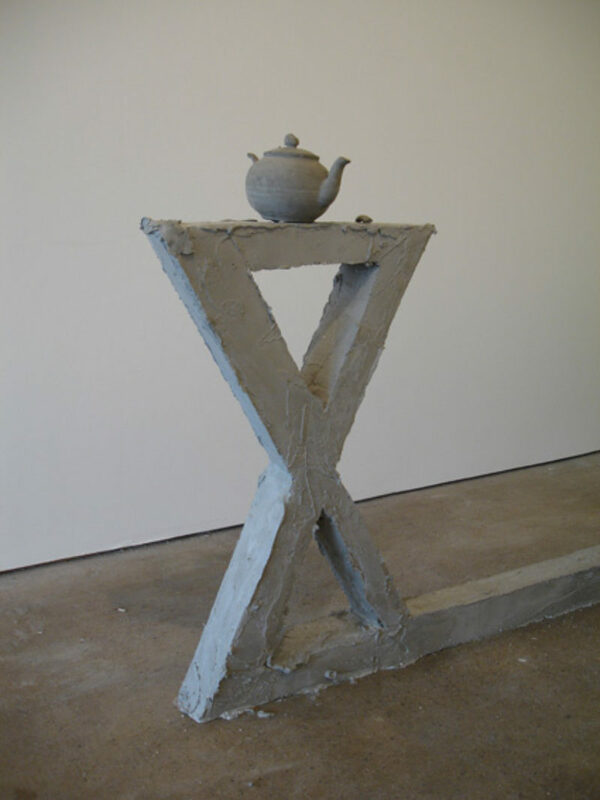 Once those words are deciphered from their brutalist framework, there’s no escaping the deliberate ideological weight of the cast teapot surmounting it all. These ideas, rendered in simple materials, defy simple readings—every potential connection unravels in a world without God, in a world with plenty of cola and beer and reckless, sleepless nights to fill that lack.